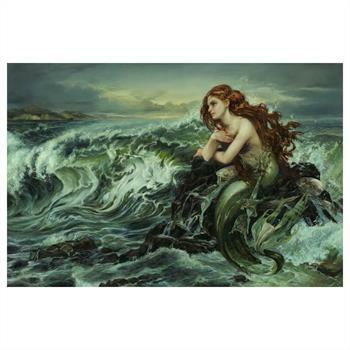 "Drawn to the Shore" is a hand embellished limited edition giclee on canvas by Heather Theurer from Disney Fine Art. Featuring The Little Mermaid imagery, this piece comes numbered, hand signed by the artist, and with a Certificate of Authenticity. Measures approximately 20" x 30" (image). Heather’s paintings are the product of decades of observation of people, environments, animals and textiles. Although she was not able to obtain a formal education in art, all her studies of the natural world in addition to the works of great artists including the renaissance masters, the pre-raphaelites of the late 19th century and modern masters have influenced he work in a way she couldn’t imagine getting in a classroom. Themes in her work include religious symbolism, fantasy realism, equine and wildlife, and bold reworking of Disney characters. Her process in painting is constantly morphing as she applies new techniques, but most often consist of a multitude layers of paint and glazes (as many as 20 or so in some cases) to reach the desired depth and detail that dominates her work. Shared and collected around the world, Heather Theurer’s paintings are constructed in the midst of a bustling family with five children in Las Vegas, Nevada. 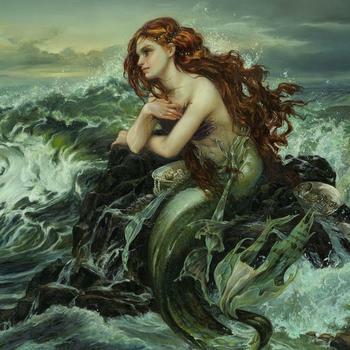 Regardless of the challenges, her art has gone on to get the attention of USA Today and the LA Times, garnered contracts with Disney Fine Art and Fantasy Con, and received recognition and awards from respected organizations such as Art Renewal Center, Artist’s Magazine and Spectrum, among others.